They made their way through the dockyard. Around them straggled most of the Scaffold’s liberty section in files and bunches. Submarines too were under wraps: perhaps for secrecy, perhaps for the rain. The quitting time whistle blew and Pappy and Clyde were caught all at once in a torrent of yardbirds: disgorged from earth, vessels and pissoirs, all heading for the gate. After some assorted drama, they find a pub called the Four Aces. It was early yet and no-one but a few low-tolerance drunks like Leman were causing any commotion. They sat at a table. 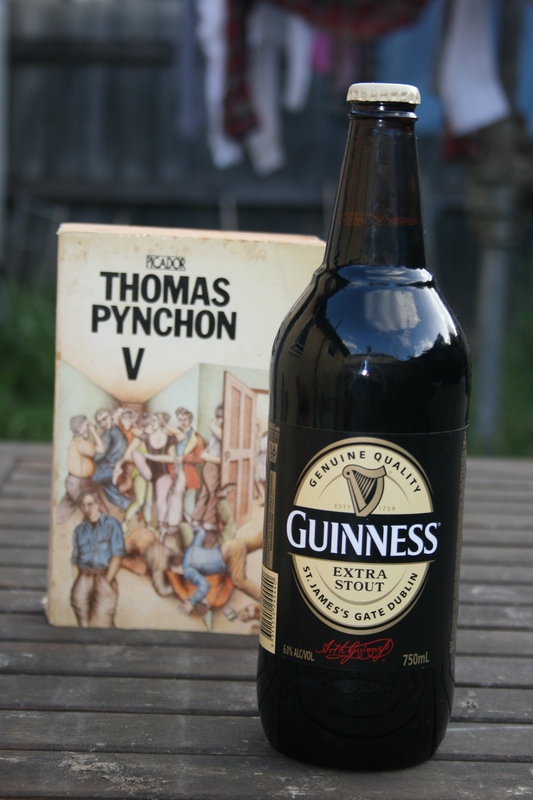 “Guinness Stout,” said Pappy and the words fell on Clyde like a nostalgic sandbag. He wanted to say, Pappy it is not the old days and why didn’t you stay on board the Scaffold boat because a boring liberty is better for me than one that hurts, and this hurts more all the time. Pappy’s depressed about his wife Paola leaving him. Clyde wants to party and Pappy’s dragging him down. 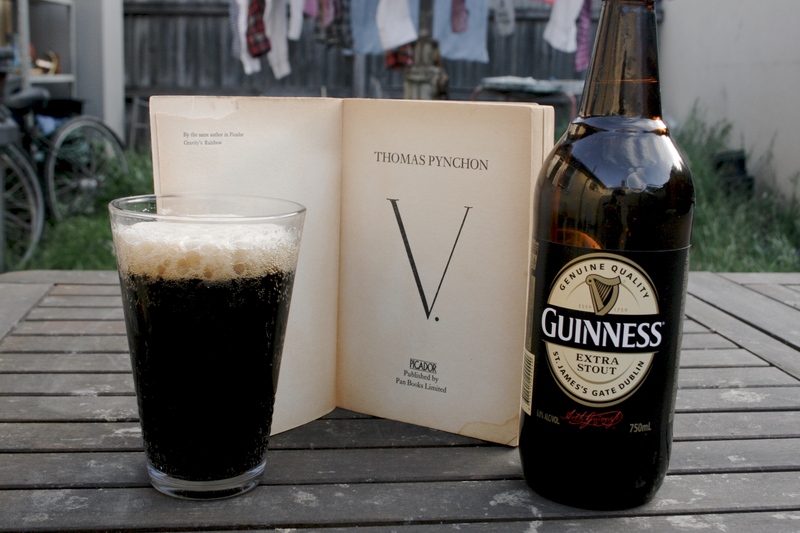 Why Guinness Stout signifies the old days for them isn’t totally clear to me. I guess Clyde would rather be slamming tequila shots or mixing vodka with soup. I can’t say Guinness Stout exactly drops any nostalgia sandbags on me; I’m more familiar with the more typical Guinness Draught. I’ve assumed it’s the Extra Stout Pappy wants, not the Draught. Guinness seems to make a big family of slightly and not so slightly different varieties, almost all of which are stouts. Even the Extra Stout varies widely depending on where in the world you buy it. Mine was 6% alcohol, but Wikipedia says it’s only 4.2 or 4.3% in Ireland and 5% in the US. My guess for Pappy’s choice seems pretty good though, because it says here that Guinness Draught was only introduced in 1959–and Chapter 16 takes place in the early stages of the Suez Crisis in 1956. The Extra Stout is the closest relative of the original. It’s bitter and dark-roast tasting, more intense than the Draught, but without its characteristic creaminess. Tastes very much like the Cooper’s Best Extra Stout from my part of the world, which I suppose is probably an imitator. Not spectacular, though it is actually the kind of thing I could happily kick off a liberty night of bar crawling with, particularly in the higher alcohol Australian version–but I can understand how Clyde might see it as a grim and dour party-pooper.